Hi folks! Here’s the latest on the Dungeonesque progress. I’ve got two different Dungeonesque crowdfunding campaigns that are in various states of delivery. 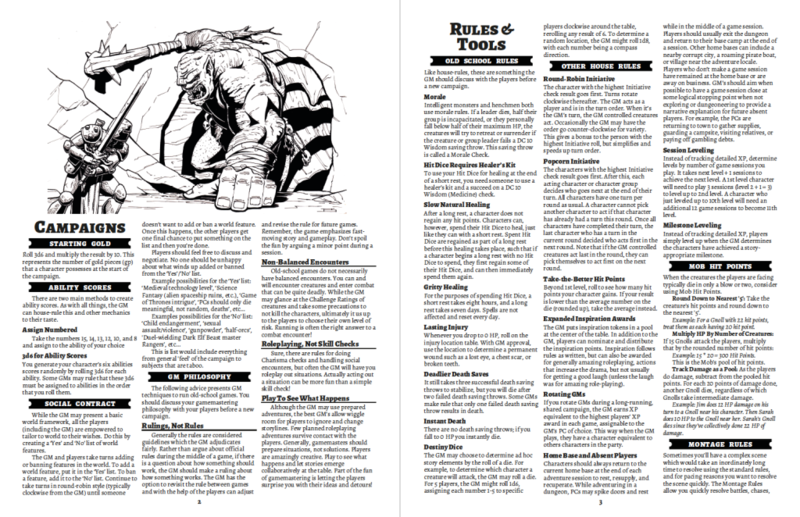 The quick summary is that the PDFs of Red Box GM’s Guide and Player’s Guide will go out to backers around Aug. 10th and that the Red Box GM’s Guide and Player’s Guide are both around 60 Pages. More details below! 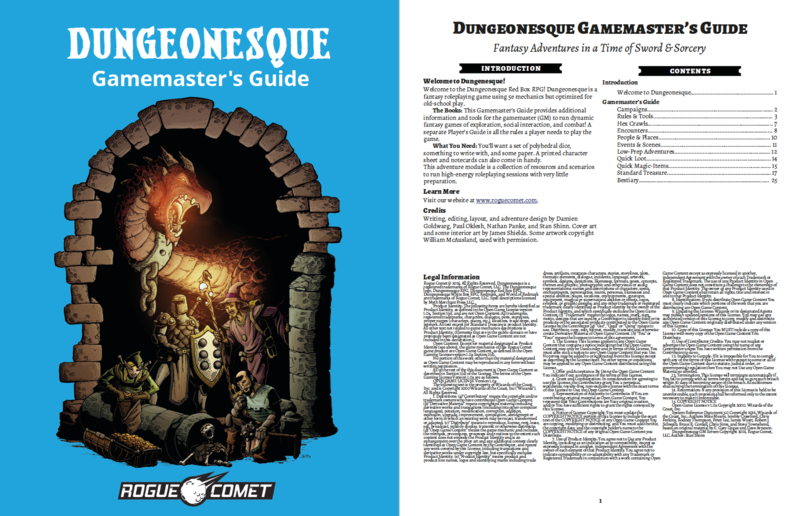 Dungeonesque Red & White Box Sets Kickstarter backers and Dungeonesque Red Box RPG Indieogogo backers will get the PDFs of the Red Box GM’s Guide and Player’s Guide along with the form-fillable character sheet PDF next week (around Aug. 10th, give or take a day or two). There’s a lot of overlap between backers, and we decided it made most logistical sense to roll everything out at the same time. We will provide more updates on other deliverables such as the White Box PDFs and physical products at that time. 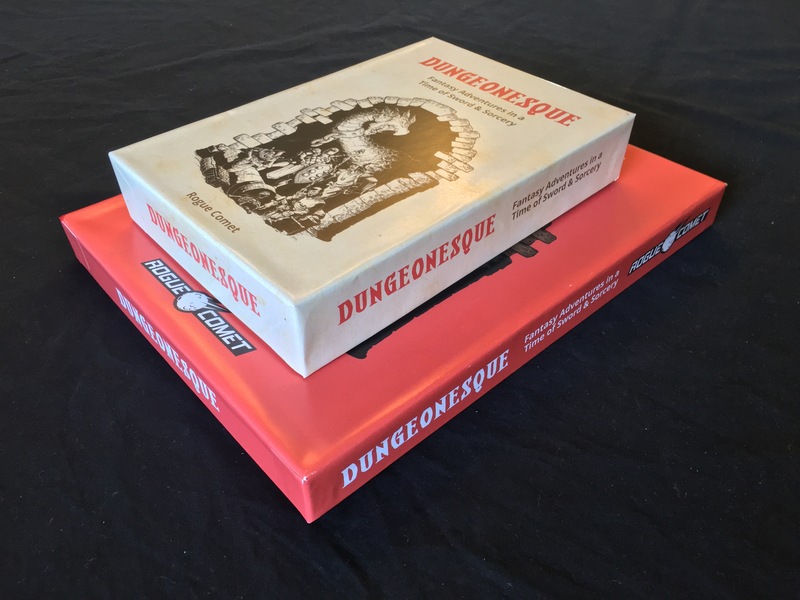 As we’ve moved into final layout after four iterations of playtest versions of the documents, we had to wrestle with a one big question: should the Indiegogo version of the Dungeonesque Red Box books be the same, or different than the Kickstarter version that ships with physical boxes? 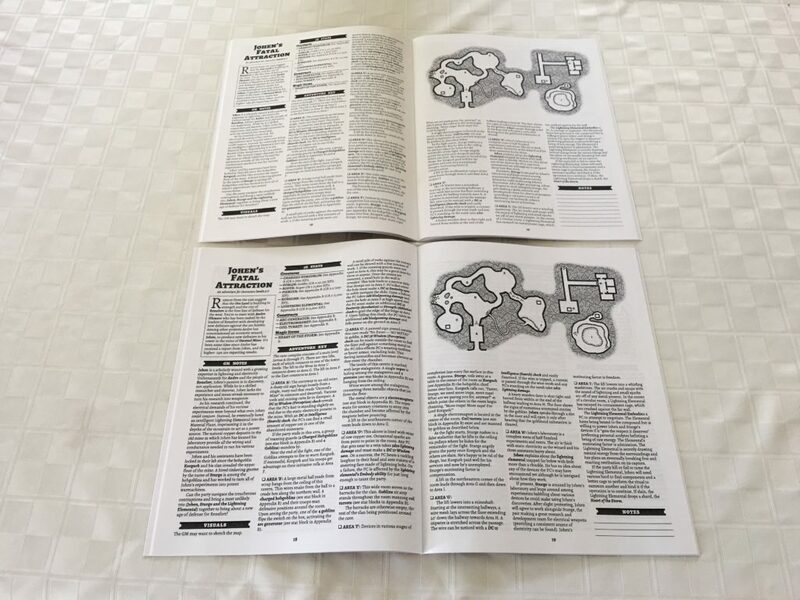 In our Indiegogo crowdfunding campaign, we committed to using DriveThruRPG to print the booklets, which has a 44 page limit for saddle-stitched booklets. In our Box Set Kickstarter, we can go up to 60 pages for the saddle-stitched booklets, since we’ll be doing a traditional print run. However, we’ve gotten feedback time and again that folks don’t want to be short-changed on content. Also, logistically we really wanted to keep the content between these two editions as similar as possible. To this end, we did some test printing to see how perfect bound fared versus saddle-stitched binding. 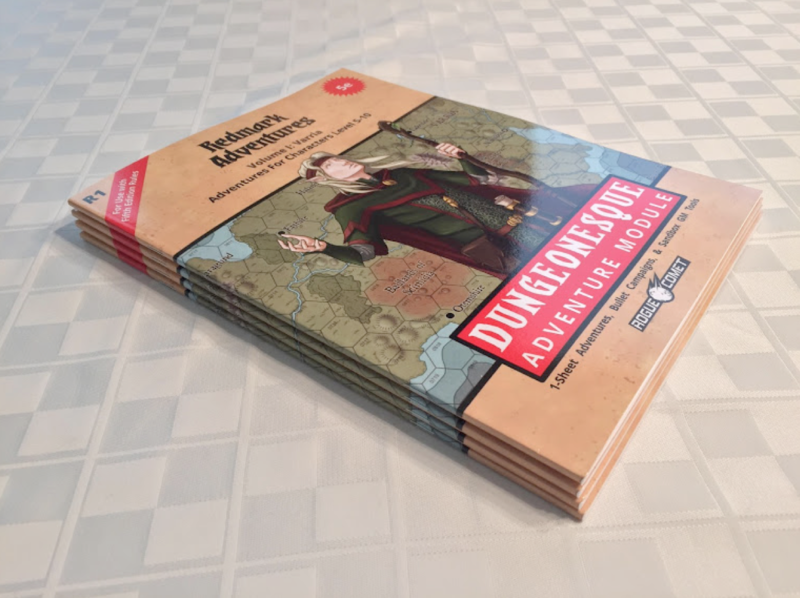 We printed out an earlier booklet we had ready of similar size and printed through DriveThruRPG as both saddle-stitched and perfect binding. 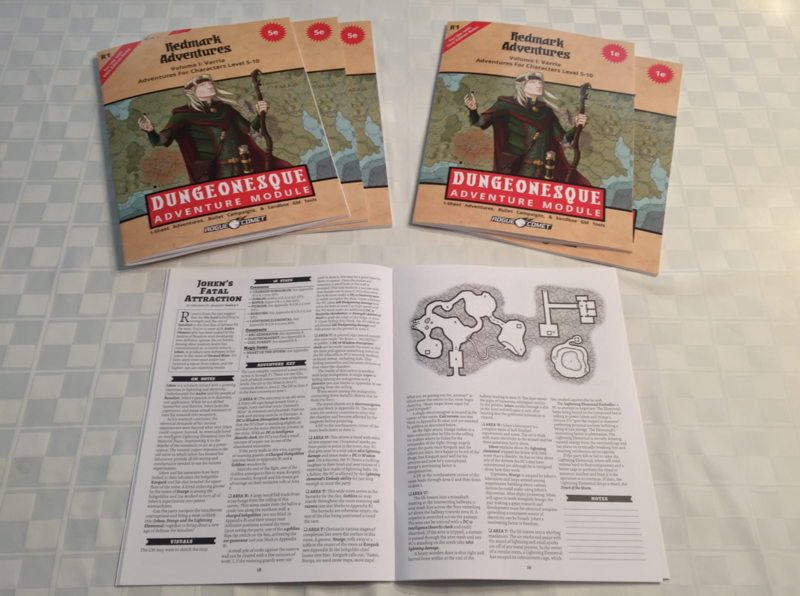 (FYI, we tried to print out the actual Dungeonesque Red Box RPG books but DriveThruRPG’s printer (LightningSource) had some issues with the color saturation on the covers which we could not quickly resolve, so we decided to use an adventure module for print test purposes). Here’s the picture of the two versions opened up. As you can see, both lay very flat. Being able to lay flat was a big goal for this product. Can you tell which one is perfect bound and which is saddle-stitch? Hard to tell isn’t it? The top booklet is saddle-stitched, and the bottom one is perfect bound. 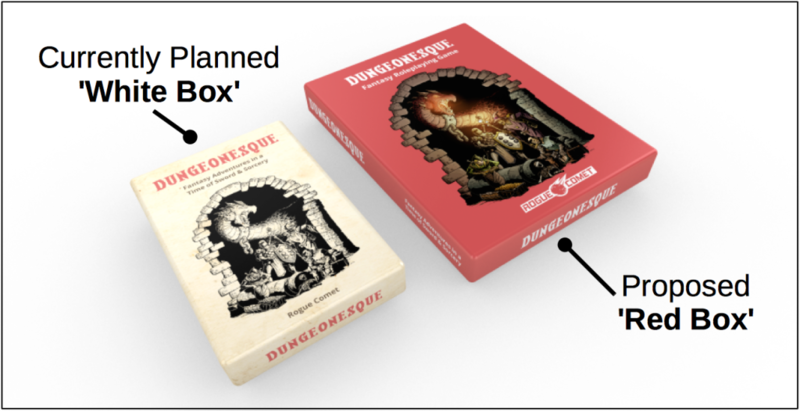 So after these print tests, we’ve decided that both the Dungeonesque Red & White Box Sets Kickstarter backers and Dungeonesque Red Box RPG Indieogogo backers will have the exact same content. Both versions will be around 60 pages per book. The solo adventure will be included in the Player’s Guide and not be broken out as a separate book. The only difference between the physical versions of the Kickstarter and Indieogogo Dungeonesque booklets will be binding: The Indiegogo backers who ordered print versions will get print-on-demand codes for a perfect-bound version (which is actually cheaper than saddle-stitch), whereas Kickstarter backers who ordered print versions will get saddle-stitched version which has staples. The picture below shows the difference between the two binding types using our ‘Adventures in Varria’ module as a sample. But both versions will have the same interior content. Let me know if you have questions! Drop me an email at info@roguecomet.com. Layout is taking a lot longer than I expected, so the final PDFs for the Indiegogo backers are going to spill into next week. Sorry for the delay folks! In the meantime, wanted to let you know we’re still hard at work on this project. 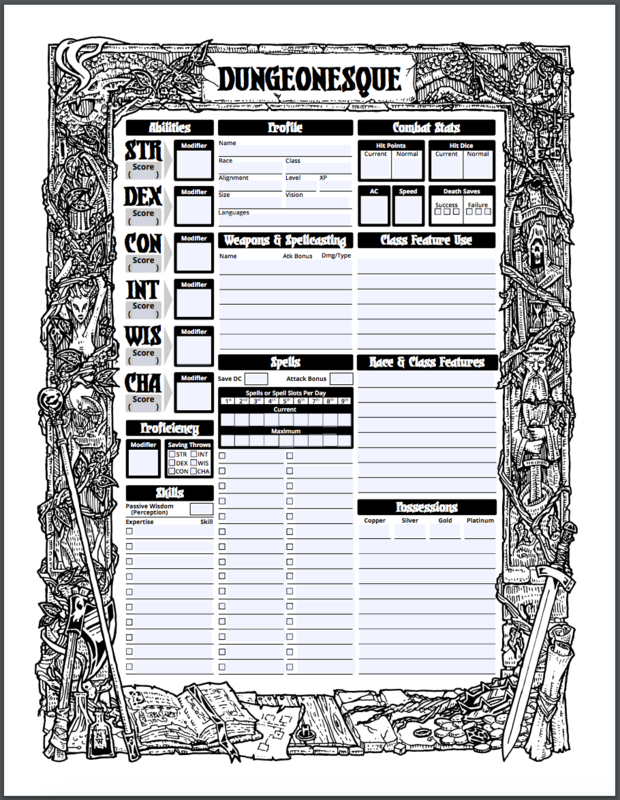 Here’s a preview of a form-fillable Character Sheet that we’re almost done with. Final products are going to be very, very cool. Thanks again for your support! Dungeonesque Red & White Box Sets (5e RPG) Kickstarter Now Live! Check out the Kickstarter which just went live! Wait, wasn’t there already a crowdfund project for Red Box? Yep. To test the market for interest, we ran a prior IndieGoGo campaign that ended in March to raise money to develop the content for the Dungeonesque Red Box RPG. That crowdfunding project was for PDFs and print-at-cost booklets only, but not boxes or traditional book print runs. We successfully raised money for that first phase of the product, but customers have been asking for two things: a physical box set, and a White Box digest version of the same content. This new Kickstarter raises money to develop the box set versions with a new White Box format. A development budget and a manufacturing budget are two different things. Box sets are not cheap to make! We appreciate our backers of the Dungeonesque Red Box RPG IndieGoGo, and to show our gratitude we’ve contacted those backers and are giving them a monetary credit in case they want to upgrade and get products from this new Kickstarter. (By the way, Fred Hicks from Evil Hat (the folks who created the Fate RPG), wrote a great article about the need for follow-up crowdfunding for physical products). Backers of our IndieGoGo Dungeonesque Red Box RPG project that ended in March are already slated to get the PDF and print-at-cost versions of the Red Box books, but if backers want to upgrade or get any of the products in this new Kickstarter they’ll get a money credit (either $5 or $10 depending on which level you pledged). Just deduct that amount from your pledge level (for example, if you wanted one of the $50 physical box sets, just pledge $40; we’ll take note that you’ve got this credit from the first campaign). If you haven’t already, take a look at our newest Kickstarter! We’re continuing our march towards optimizing 5e for old-school play! BackerKit email surveys just went out — be sure to answer that as it will be our official way to get you the pre-release and final products. We’ve updated the release schedule to allow time for more feedback and refinement. Next version of the PDFs will come out around July 1, with final products likely by end of July. Look for news next week on the Kickstarter for the physical boxes! Today (after working through some Indiegogo / Backerkit integration challenges the last few days) we sent out a survey from BackerKit. BackerKit is our standard tool that we use with crowdfunding platforms Indiegogo and Kickstarter to allow people to make last minutes changes to their pledge. It’s also the way we distribute links to our customers to get the latest Dungeonesque Red Box RPG. 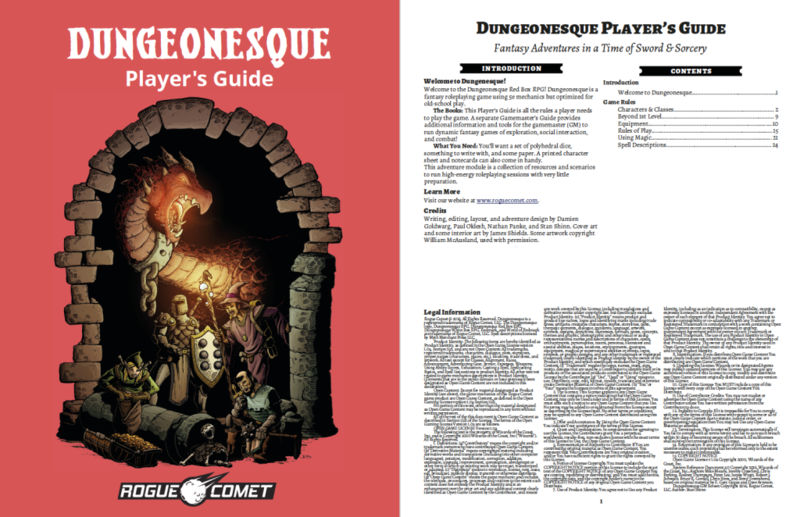 For those participating in the private Google+ Dungeonesque Red Box group, you’ve already had access to the PDFs for a few days, but this allows non-beta test participants to now access the files. 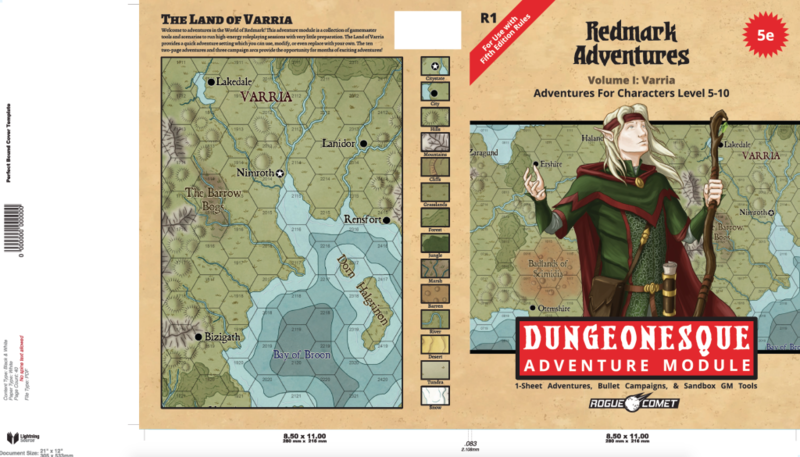 The survey also allows those who are interested to order the World of Redmark Maps PDF Set and the 5e Adventure PDF Collection, some products that we released earlier this year. I imagine other funders would agree with me in saying we would prefer to wait for a totally refined version to get it printed. Good things take time. Keep up the good work! And thanks for your efforts. Based on great ideas folks are giving us, plus some refinements we realize are still needed, we will do at least one more release of PDFs (possibly two) and get feedback before we lock down the product for final release. This means we’re looking at roughly July 1 to release a new version of the PDFs, and likely end of July for the final products to lock down and be released. What Will Change in the Next Version? We do also plan to add a better table of contents and index hyperlinks in the PDF. We’ll want to finalize the content before we add this though. What About the Physical Box Sets? Stay tuned! We hope to make a big announcement next week on Phase II of our Red Box roadmap — a Box Set Kickstarter is soon coming your way! For those of you who backed our recent Kickstarter and ordered hard copies of the main adventure, we’ve got great news! Final products are now shipping! ‘Redmark Adventures Volume 1’ ended up being 40 pages. It has a final title of ‘Redmark Adventures Volume 1: Varria’ which refers to the region in the World of Redmark in which the adventures occur. Want to transplant the adventures to another setting? No worries; that’s easily done. But for those wanting a nice, quick adventure setting rich with plot hooks and maps, we’ve included great content. Each new adventure module we produce in this series will detail a new region of the World of Redmark and have additional maps and locations. Stay tuned for new product announcements coming soon! Check your email inbox. Print product backers will be getting emails from DriveThruRPG.com with the links to print-at-cost codes to order your print products. All backers will also get emails from Backerkit with new links to the permanent location of all final Digital products, now hosted on Dropbox.com. There’s more to it than that (for example, why the final print-at-cost price is slightly higher than I expected). To learn more details about the final products, read below. Backers who are getting print products will get an email in the next few hours sent from DriveThruRPG.com. 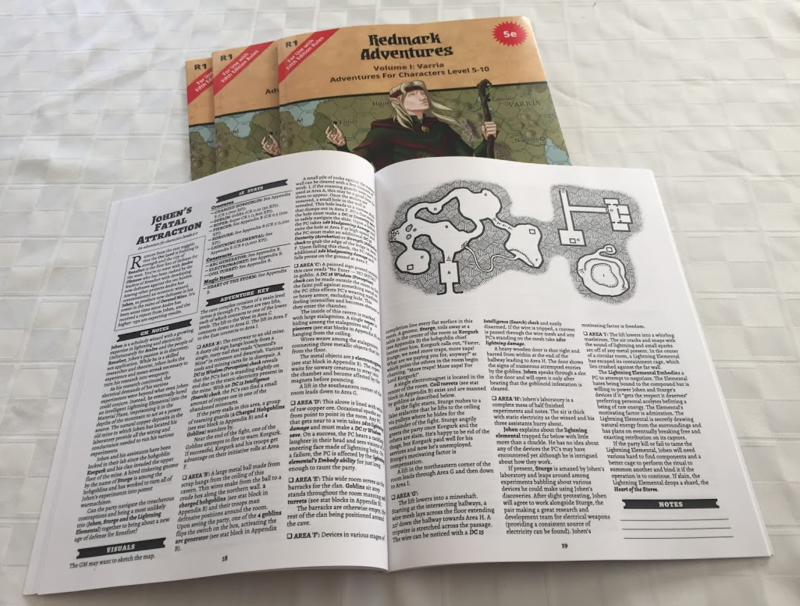 Click on the link in that email and it will route you to DriveThruRPG.com where you can get a print copy of the adventure module. You pay only the printing cost of the module plus shipping and handling. All backers who are getting print products will get emails for both 5e and 1e versions. You can get one or both printed out at cost. Backers who added extra money to get more than one copy will get multiple emails, one for each discount code. Separate from DriveThruRPG.com, I’ll be sending you an email from Backerkit which will have new links to get Digital copies of all products you’ve ordered. I’ve decided to use Dropbox.com as the permanent source to host the digital PDFs. Bookmark the link you get — if there are errata or changes that we make to the PDFs, the Dropbox link will be the place you can always get the latest and greatest copies! 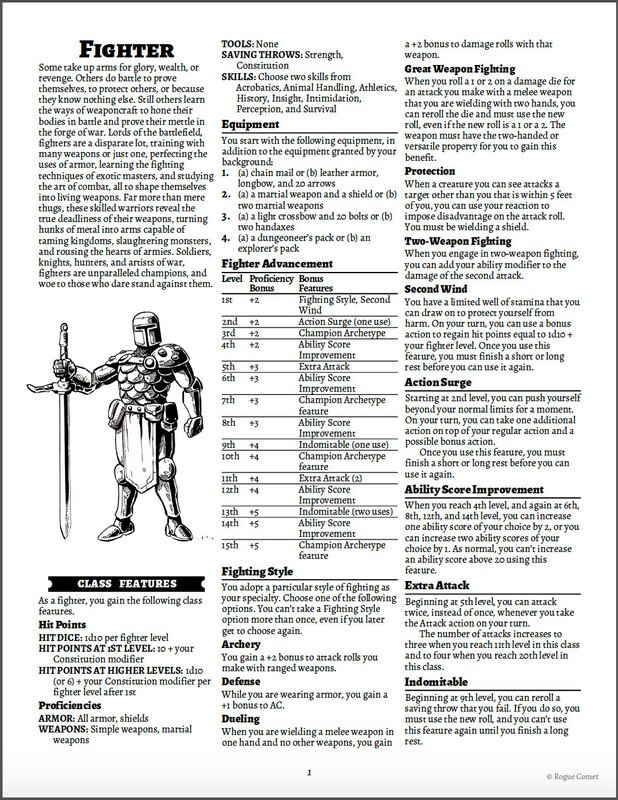 Why not house the PDFs on DriveThruRPG.com? Great question. We’ve decided to partner with the new site TableTopLibrary.com as our distribution partner. TableTopLibrary.com is important to us since we’ll be producing box set RPG products in the months ahead and they can warehouse and deliver these products for us — something DriveThruRPG.com cannot do. TableTopLibrary.com requires an exclusive contract with them, so we cannot host 5e PDFs with DriveThruRPG.com if we are using TableTopLibrary.com for warehousing and shipping. While DriveThruRPG.com is a great all-in-one-place retailer to centrally house your RPG PDFs, we believe the strategic importance of being able to do products such as box sets make TableTopLibrary.com the ideal choice for us. We hope you like the products we’ll be announcing soon available through TableTopLibrary.com! Now, back to the print delivery. Pictured above is the final product. It looks great, and has a full color map of Varria on the rear cover. Originally we gave the estimate that the print edition was expected to be around $2.48 USD for the standard Black & White print version. The final cost is a bit higher. Here’s why. Our final version was 40 pages instead of 36 pages. That by itself increased the cost a bit. Then we had some issues getting the right binding. The original print copies that I got from OneBookShelf (DriveThruRPG.com) came back as perfect bound — this is the type of binding where the side of the booklet is glued and not stapled. It looks great but doesn’t lay as flat as I was hoping. 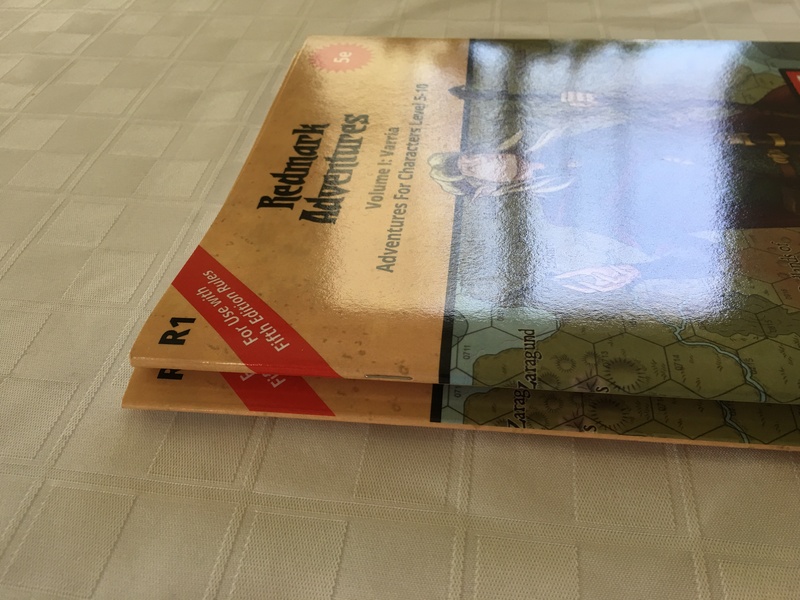 Apparently OneBookShelf will only do saddlestitch binding if you print full-color copies. I did not want to sacrifice quality, so I ordered a second set of proof copies, this time printed using the full-color process (the interior is still black-and-white, but this way we can get the stapled saddle-stitch binding). I am really in love with this type of printing quality — see pictures below. The interior is not glossy and you can write on it with pencil or pen just fine. It’s the ideal binding and the quality I really wanted for these booklets. The downside is this new print binding costs more — $6.20 for 40 pages instead of the $2.48 for 36 pages I had originally estimated. This is a $3.72 increase over my original estimate. Maybe not a lot but I feel bad about the cost being a little higher! Given the $3.72 price overrun, here is what I would like to do. All backers for the ‘Dungeonesque: World of Redmark’ print products will get a $5 credit on future Rogue Comet Kickstarter products. How do you get this discount? On my next Kickstarter, simply pledge $5 lower than whatever amount you need to pay for a product. When I send out the Backerkit survey I’ll have a question that you can answer that lets me know you had a $5 credit from this first Kickstarter. I appreciate your support, and hope you’ll continue to enjoy these and future products we release with the help of generous backers like you! We’d love your feedback! We have a new survey with questions about the Red Box RPG products. Please visit http://goo.gl/forms/H3XewruuN5 to take a quick one-page survey. We appreciate your input! Next week we’ll invite Dungeonesque Red Box RPG Indiegogo backers to a private social media group we’ll be setting up. Our Beta program will be a bit like the Wizards of the Coast D&D Next beta program. We’ll release bits and pieces at first to get specific feedback, and over time, we’ll release the entire product. This way we can make sure and get maximum feedback and craft this game to be the best possible product. We’re working on a box set version of the Dungeonesque Red Box RPG which will include additional content such as several adventures. Check out this art we just received which will be part of the upcoming adventure product! Thanks to your feedback we’ve rewritten one confusing paragraph and fixed a couple of minor formatting issues in the recent ‘Redmark Adventures Volume 1’ product. We’ll be re-issuing the updated PDF in a few days. Earlier this month we got back our first wave of print samples from One Book Shelf (DriveThruRPG.com). For the most part it looked great! We did see two issues we wanted to address, so we made changes and ordered a second set of proofs. We should be getting those back next week. If all goes as planned we’ll then set up the print codes and deliver the final print-at-cost codes to Kickstarter print backers so they can order their print version of the adventures. We’re wrapping up the final hours of our Dungeonesque Red Box RPG Indiegogo campaign. Earlier today we announced our partnership with TableTopLibary who will be our distributor for box sets and other future products. Our Red Box RPG is now expanding to a third book as we introduce a new Quickstart Guide. We also give details on how current Indiegogo Backers will get credit towards the future box set products (so in addition to getting the products they’ve pledged towards, they’ll also get credits towards these future products if they have interest in them). Keep reading to get details on the above, plus see some samples of upcoming art for different products! Last Chance for Dungeonesque Red Box RPG Pledges! Two days left in our Dungeonesque Red Box Indiegogo fundraiser! We shared some of our early layouts and art yesterday. Join our campaign today and you’ll be able to help shape the direction of these products! We’ll be setting up a private discussion group to allow our backers to give us feedback as we create our products. First off, check out the press release about our partnership with the newly launched TableTopLibary.com. This new service will also allow us to sell products like box sets, large poster maps, dice bags, and other physical products that online RPG storefronts have traditionally not provided. We will share more details in the days ahead as we start to move all our PDF and print product distribution to this new, exciting storefront. Last week we ordered print proofs for our 5e adventure ‘Redmark Adventures Volume 1’. After we’ve happy with the print samples, we’ll be able to publish the print version and make it available to backers of our recent Kickstarter. Sometime after that, we’ll do a print run of the adventures and put them up for sale at tabletoplibrary.com. We will deliver the Indiegogo products as originally planned, while adding a third book— a Quickstart Guide. See details below. In the months ahead we’ll move on to do box sets which will package the content a bit differently. Backers of our current IndieoGoGo fundraiser will get a credit towards getting these new products in case they want to ‘upgrade’. I’ve been doing layout and playing with how the content will work. Right now our initial product plans are geared around using print-on-demand through OBS (drivethrustuff.com) for print fulfillment. OBS uses Lightningsource.com to do print fulfillment. We’ve got a hard cap of 44 pages if we are to keep the format in saddle-stitched booklet format (as opposed to perfect bound which is like a traditional paperback). We can add a third book but keep all the content and art. With this choice in mind, we plan to add a third book — a quickstart guide that will run 15-20 pages which you’ll be able to print yourself, or use the print-at-code codes I’ll give you to print a booklet from OBS (drivethrustuff.com). Book ‘0’: Quickstart Guide. This will be a quickstart guide and overview to the game which will run about 20 pages. This is the booklet that the Choose Your Own Adventure style solo adventure will appear. It will also review the most important rules of the game, helping long-term players quickly identify what rules are most important to master. Book 1: Players Guide. First 22 pages will cover character creation (supporting characters up to level 15) and the rules of the game. 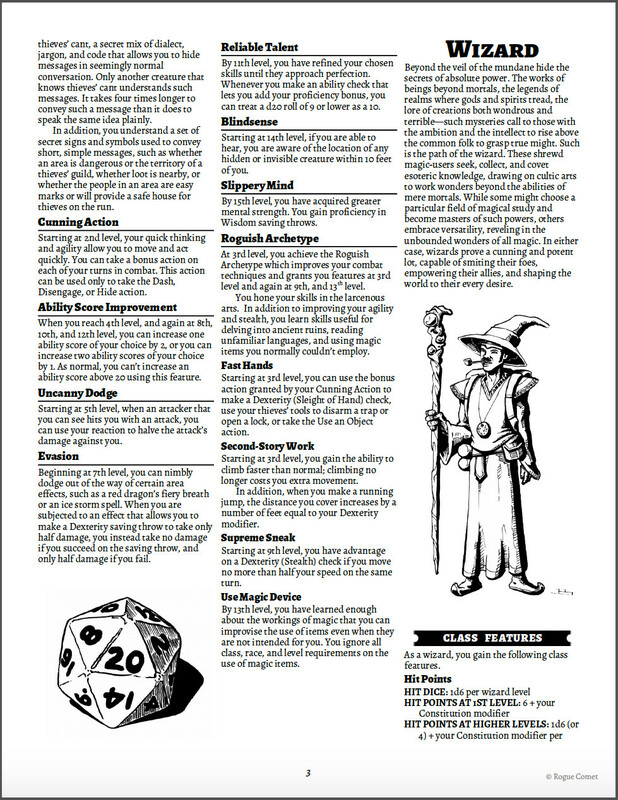 Second 22 pages will be a list of all the spells that Wizards and Clerics can use. Book 2: GM’s Guide. 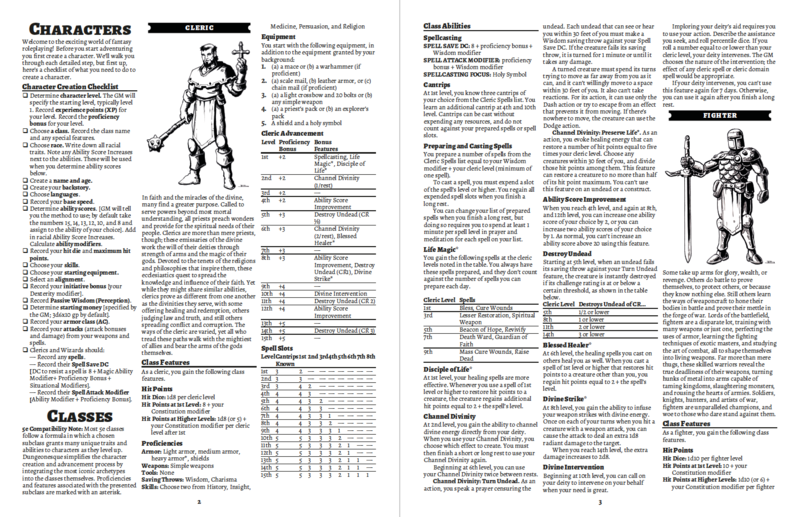 First 22 pages will be the core GM tools to run the game. Second 22 pages will be a concise bestiary. After we deliver the above Indiegogo products, we’ll move on to Phase II, which is repackacking the content for physical box sets. We’ll use traditional printers and have a distributor to sell these products for us. When we do the physical box set for Dungeonesque Red Box RPG (which is not part of this current Indiegogo fundraiser but will be a future project) we’re evaluating the option to combine both Book 0 and Book 1 into one larger booklet which will run around 60 pages and be printed using a traditional printer and offered for sale as part of the physical box set. Here’s how it would work for these 8.5×11″ booklets. There will be no solo adventure in the White Box version due to space. So, lots of consumer choices for the same product! Since we’re planning on a Phase II and evolving into physical box sets, we want to reward our customers currently backing the Indiegogo fundraiser. We’ll deliver the Kickstarter Box Set PDFs before we deliver final Indiegogo PDFs, so Indiegogo patrons can choose to EITHER get and print the Book 0 set (1st edition) OR just get credit and upgrade to the KS version which repackages the content into two Red Box books. Indiegogo backers will get both final products in hand in digital form and can make a choice before they print things out. 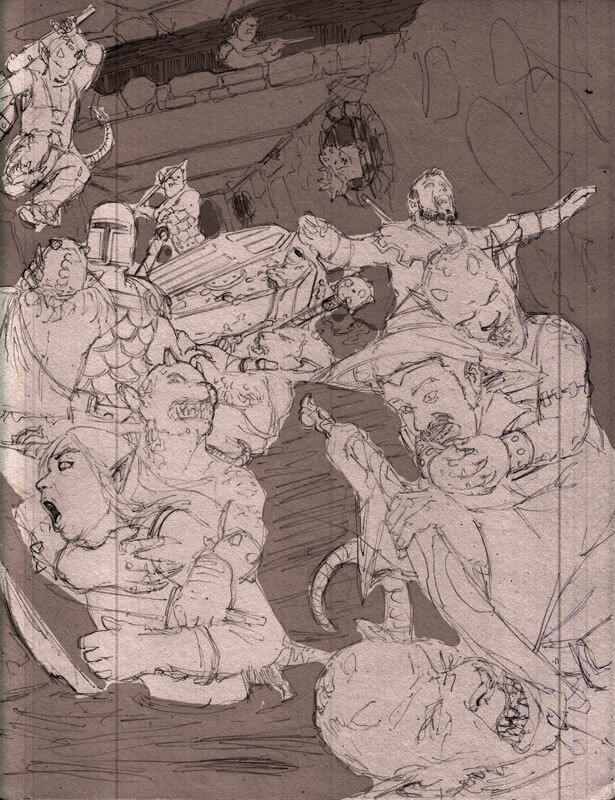 James Shields is currently developing some new art for the Dungeonesque Red Box RPG. 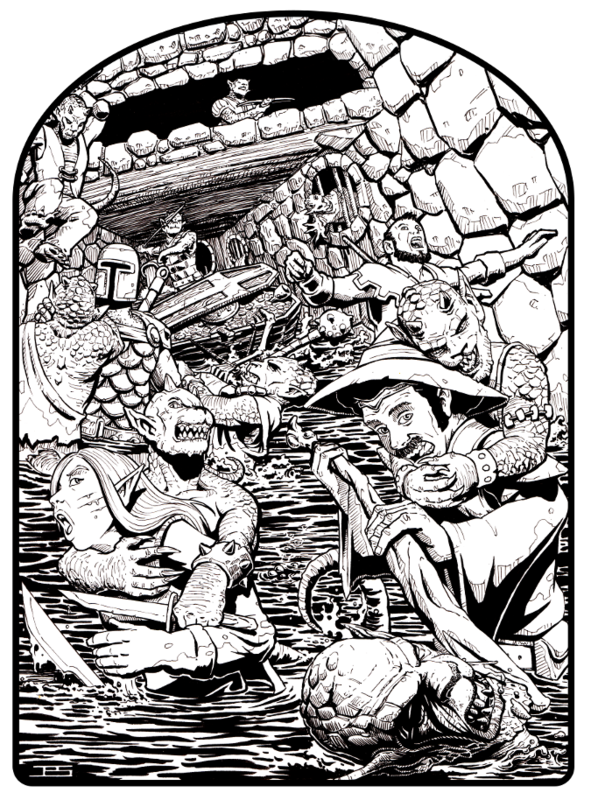 We’ll use this in two places: 1) as a black-and-white art for a custom cover for Red Box RPG booklets for those who want to print it themselves, and 2) as a full-color version for a not-yet-announced future Red Box RPG product. Stay tuned — we’ll have more news to announce in the weeks ahead! Rogue Comet, along with Kobold Press, Frog God Games, Troll Lord Games, Green Ronin, Hero Games, Pacesetter Games and Simulations, Eldritch Enterprises, Far Future Enterprises, and TableTopLibrary.com are jointly announcing that, effective immediately, our companies are offering our products for Fifth Edition and other roleplaying games for purchase at a new RPG store called TableTopLibrary. TableTopLibrary is a newly-formed online store for RPG products which will offer centralized electronic book fulfillment, Kickstarter product fulfillment, and single-location warehousing. TableTopLibrary will improve delivery speed, accuracy, and customer service for RPG products. This new storefront will allow us to offer higher-quality printing, paper quality, and binding than print-on-demand typically offers. It will also allow us to sell products like box sets, large poster maps, dice bags, and other physical products that online RPG storefronts have traditionally not provided. Check out Rogue Comet’s initial PDF versions of our 5e adventure products. We will be expanding our product line to include physical books, posters, and box sets for 5e and other game systems in the months to come. If you want to browse an ever-growing library of RPG products for Fifth Edition and other roleplaying games, we’re letting you know that there’s a new online game store in town. Check out Rogue Comet’s initial products offered at www.TableTopLibrary.com! We think you’ll be impressed. Two days left in our Dungeonesque Red Box Indiegogo fundraiser! I’ve got a few updates I’ll share between now and Saturday. We have art commissioned and some of that art is starting to trickle in. I took a shot at doing some layout so you can get a sense of how the final product will look. Here are some examples. First up is the Fighter. Next comes the Rogue. We thought about naming this class ‘Thief’ to make it feel more old-school, but one of our guiding principles is that you can have a player using Dungeonesque books at the same game as a player using a 5e Player’s Handbook, so we want to keep the rules and terminology consistent. 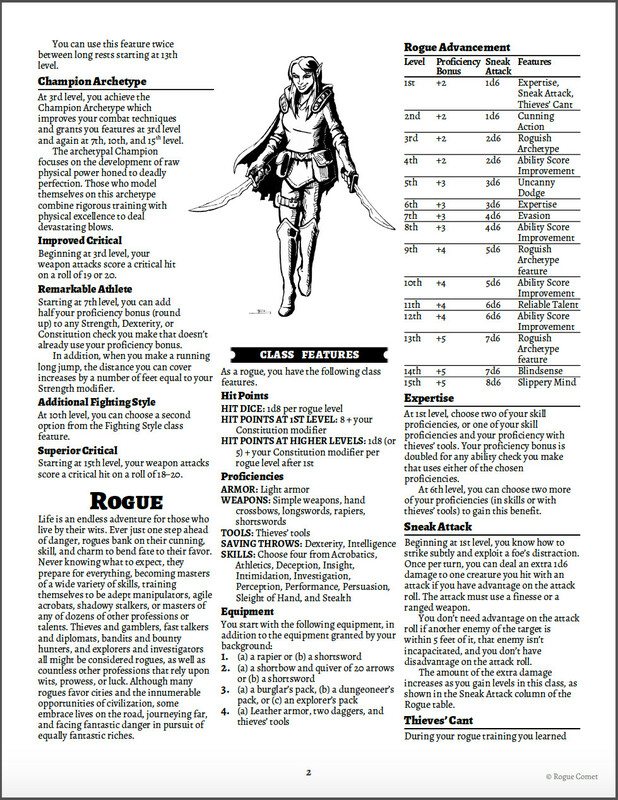 For that reason, we’re still calling this class ‘Rogue’, though we’ll talk a lot about the Thief aspect of this class. The last screenshot for today is the Wizard (using the term ‘Wizard’ instead of ‘Magic-User’ for the reasons mentioned about, but we’ll likely update the flavor text to refer to ‘Magic-User’ as an alternate name). That’s it for today’s update! More news over the next couple of days as we approach the final hours of our fundraising! Want to join us and help shape the direction of these products? Back our Dungeonesque Red Box Indiegogo fundraiser!